Democratic New York Senator Chuck Schumer will announce he opposes the nuclear deal between Iran and the six world powers. 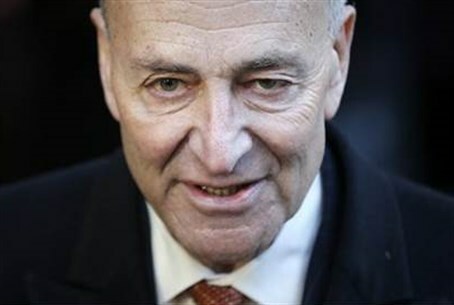 New York Senator Chuck Schumer, the chamber's third-ranking Democrat, plans to announce his opposition to the nuclear deal negotiated by Iran and the six world powers, three people familiar with the matter told The Huffington Post on Thursday night. Schumer's announcement comes after New Hampshire Democratic Sen. Jeanne Shaheen and Schumer's fellow New York senator, Kirstin Gillibrand, announced their support for the deal. It was followed by opposition to the deal from another leading Democrat, Eliot Engel, the ranking Democrat on the House foreign affairs committee. Engel said, "I still believe that a negotiated solution is the best course of action. That's the path I believe we should pursue. But...I regret that I cannot support this deal." Schumer's support of a war footing over diplomacy puts him at odds with the Democratic caucus he intends to lead next term, though it is consistent with the position he has long taken, noted The Huffington Post. The senator did not immediately respond to a request for comment but later gave the New York Times a lengthy statement on his position. Schumer’s announcement comes several days after reports emerged that he would oppose the deal following a strenuous campaign pressuring him to do so. More than 10,000 phone calls have flooded Schumer's office line the past two weeks, while another group has shelled out a seven figure sum for TV ads in New York City to pressure Schumer and other lawmakers to vote against the plan. Also this week, leading Democratic Reps. Nita Lowey and Steve Israel, both of New York, and Ted Deutch of Florida announced their opposition to the Iran deal. President Barack Obama has threatened to veto any legislation passed by Congress blocking the deal, but Congressman Peter Roskam (R-IL) said on Monday he was confident a new Congressional resolution calling to end the Iran nuclear deal would secure the support of two-thirds of lawmakers, thus rendering Obama unable to veto it.